NEW YORK, New York — In June, the Armenia Fund launched a kindergarten-construction project in Ghuze Chartar, a village in Artsakh’s Martuni Region. The initiative, co-sponsored by the Fund’s French affiliate and the government of Artsakh, is made possible through the financial support of Jean-Michel Grunberg, chairman of French toy manufacturer Ludendo Group, and Michel Pazoumian, chairman of the French companies Berenice and Eurelia. The contributions were made in memory of Emmanuel de Labarre, a Fund benefactor who, during the last years of his life, was a key supporter of development projects in Artsakh. Until the completion of Ghuze Chartar’s new kindergarten, the community’s children will continue to go to the old school building, which was built in the 1930s. Currently, construction crews are laying the foundation for the new kindergarten. The two-story building, with the capacity to accommodate 80 students, will feature multiple modern amenities, including spacious classrooms and various activity rooms, a kitchen, a medical clinic, and a laundry room. Air-conditioned, centrally heated and compliant with stringent fire-safety standards, the kindergarten will also feature a sizeable playground. “Whether living in large cities or far-flung villages, our children deserve to have a wonderful childhood, including a safe and pleasant learning environment,” says Ara Vardanyan, executive director of the Hayastan All-Armenian Fund. The Ghuze Chartar kindergarten project is among a great many school renovation and furnishing initiatives sponsored by the French affiliate of the Armenia Fund, which has systematically focused on such projects since 2004. In 2009 alone, 103 schools in Armenia and Artsakh received new furniture through the sponsorship of the French-Armenian community, resulting in comfortable, furnished classrooms for more than 10,000 students. To date, 26,000 schoolchildren in Armenia and Artsakh have been provided with new classroom furniture through the support of the French-Armenian community as well as the government of France. ABOUT ARMENIA FUND USA: founded in 1992, was one of the first of Hayastan All-Armenian Fund’s 18 international affiliates and serves constituents in all states east of the Mississippi. As a non-profit, non-governmental, nonsectarian organization, the Fund represents all Armenian constituents. 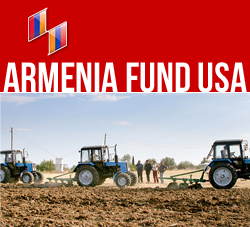 Armenia Fund USA is the largest contributor among the 18 international affiliates – supporting strategic infrastructure projects in Armenia and Karabakh. The Fund has adopted a policy to go “Beyond Bricks and Mortar” to provide sustainability for projects it sponsors.